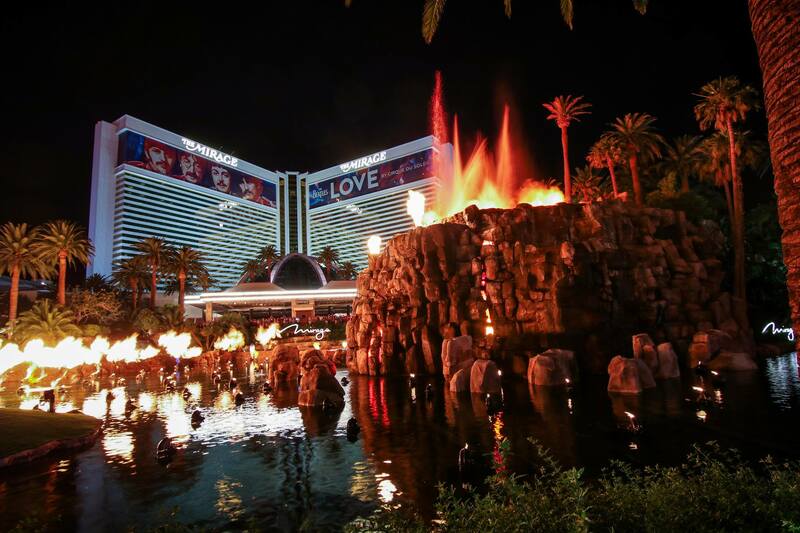 In the heart of the Las Vegas Strip, you’ll find Sin City’s original mega-resort: The Mirage. 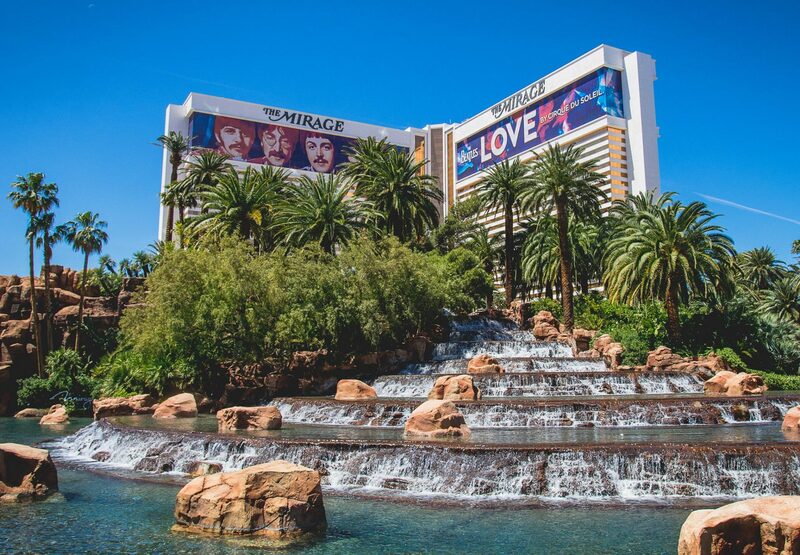 Created by Steve Winn, The Mirage opened its doors in 1989 and single-handedly helped restore Las Vegas’ glory after decades of failing tourism. For a resort to not only revive Las Vegas but to make it the world-destination that it is today, The Mirage *had* to be perfect. And it is. Unlike Vegas’ smoke-filled, low ceiling predecessors, The Mirage changed the game. 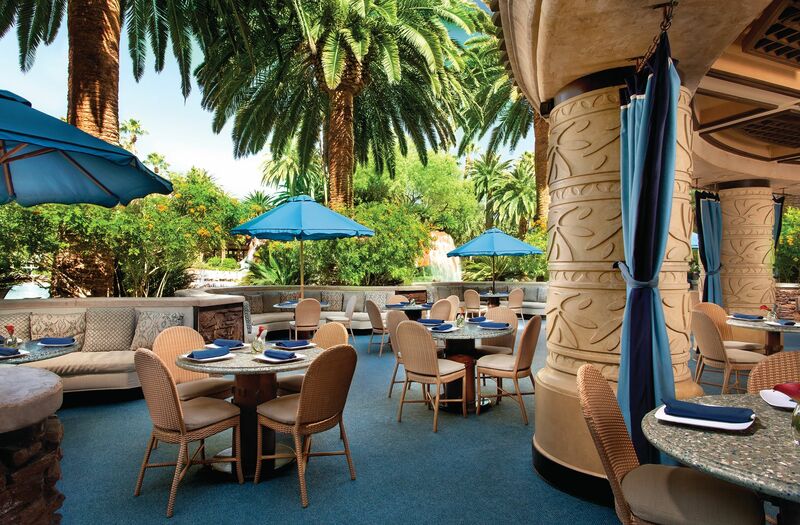 When other hotels lacked themes, The Mirage created a Polynesian-themed tropical oasis. Where there were long-windowless rooms, The Mirage created bright-open spaces. As hotels focused on gambling only, The Mirage created world-class pools and welcomed one-of-a-kind entertainment. 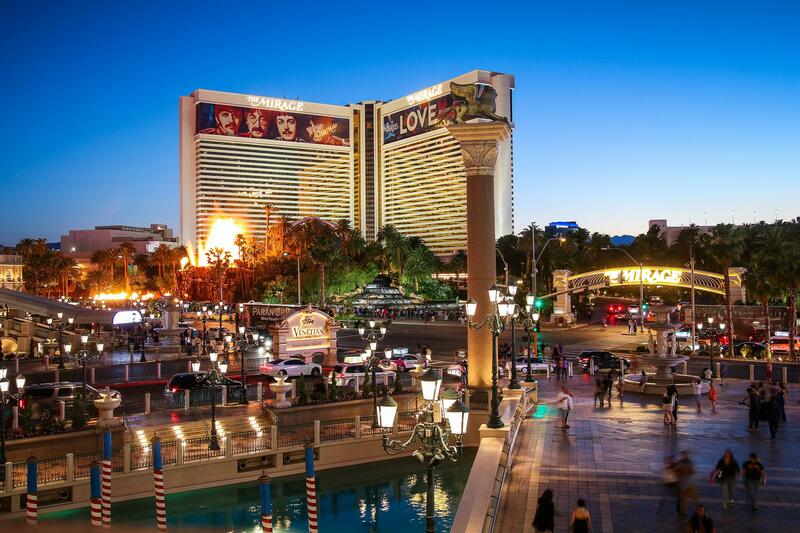 The Mirage was a game-changer for the hotel industry, and it continues to do so today. 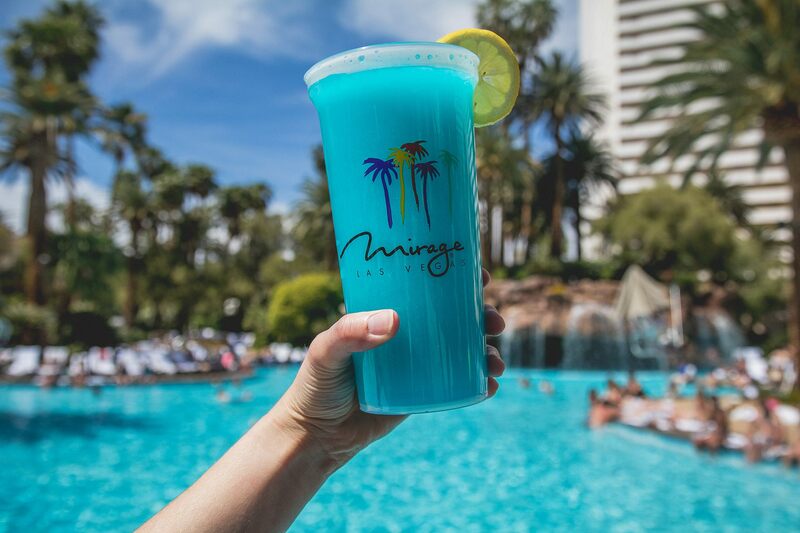 After their most recent renovations in 2015, the Mirage was able to continue their ground-breaking ways by introducing modern rooms, open new lobby restaurants, and create 21+ pools. All of this, while keeping the unique atmosphere that made The Mirage great, to begin with. 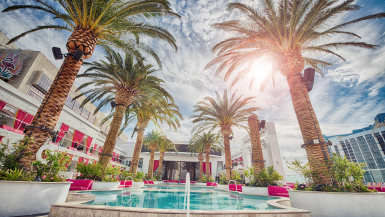 If you’re planning a trip to Las Vegas, here’s everything you can expect from a stay at The Mirage. With a blend of Polynesian-landscaping, themed music, and a tropical coconut-mango scent that is diffused throughout the entire property, your Mirage experience begins before you even step inside the front doors. 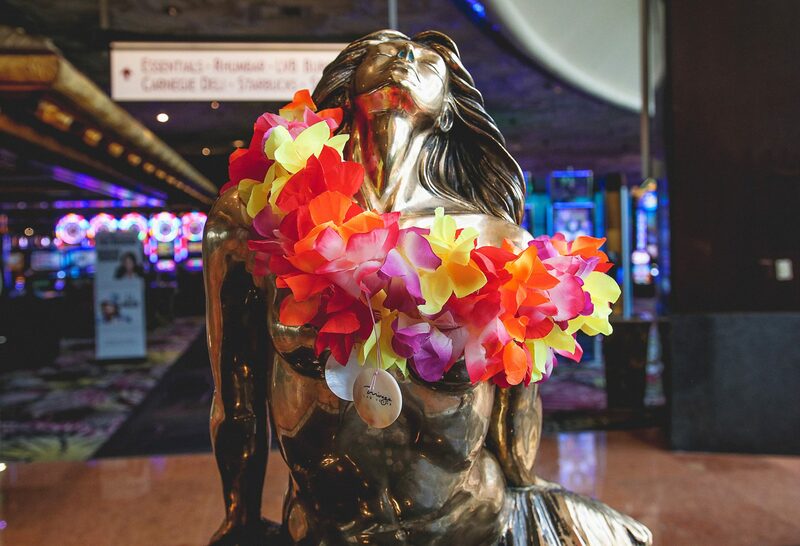 Staff members wear Hawaiian shirts with leis, you’ll pass a massive volcano with cascading waterfalls, and the consistency is so on-point at The Mirage that you’ll truly feel like you’re in a desert oasis. Guests eyes are first drawn to the check-in area where the backdrop is a 20,000-gallon saltwater tank. The indoor coral reef is home to approximately 450 fish from 85 different species including angelfish, puffer fish, tangs and other exotic sea creatures. 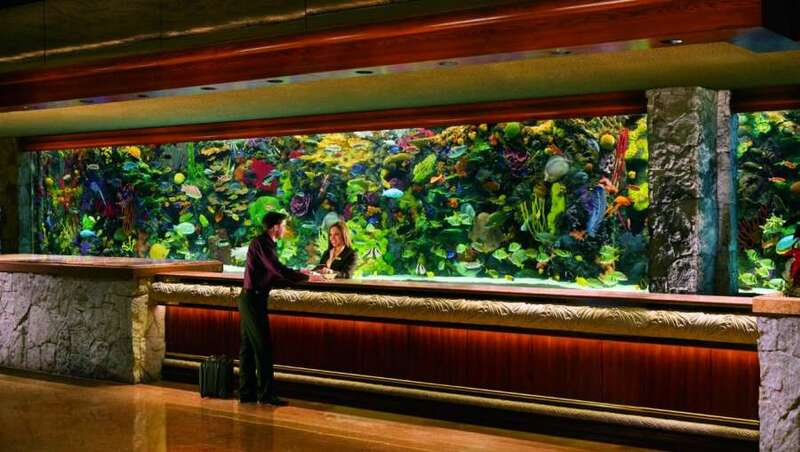 It’s one of the most elaborate hotel aquariums in the world, and it’s my personal favorite. While the check-in line tends to be short, you’ll hardly realize you’re waiting, as it’s entertaining watching the fish swim around and play with one another. Note: The fish species were all selected for their adaptability to the environment and compatibility with other species. You’ll never have to worry about any of the species fighting which is awesome! The check-in process always goes by fast, and if your room isn’t ready by the time you arrive (shoutout to early arrivals), they’ll still hand you room keys, they’ll hold your belongings, and you’ll be texted your room number once your room is ready. It’s the perfect solution which allows you to explore from the moment you arrive, without needing to visit the check-in line again. 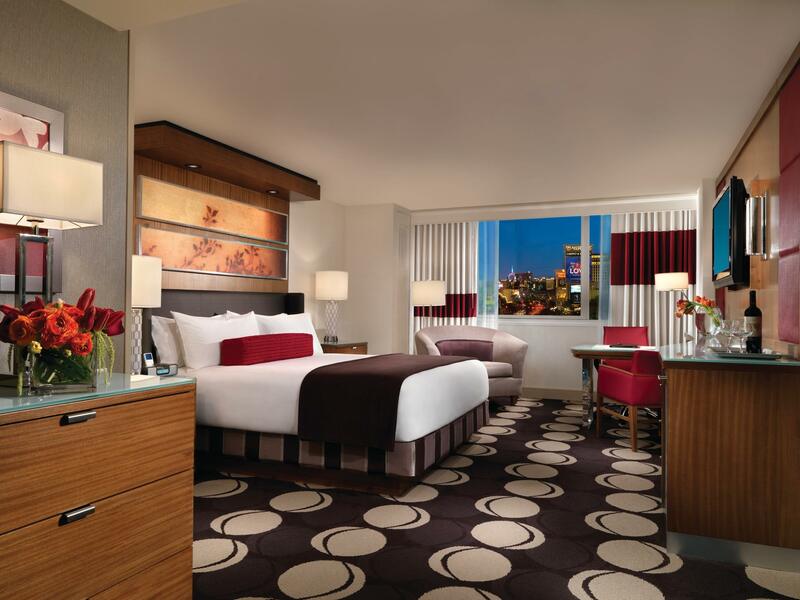 Every room at The Mirage feels like a suite. At 400 square feet, these rooms are quite spacious compared to competitor mid-Strip properties, and you never feel like you have to walk over your luggage while staying here. Their rooms are colorful, comfortable, and loaded with plenty of outlets, Bluetooth speakers, and free high-speed internet! As someone who often has to check emails while on the road, it was refreshing that the workspace in these rooms doesn’t face a wall, but rather your choice of the TV and bed, or your incredible view outside. There are numerous plug-ins throughout the room, many USB friendly, so you never have to call dibs on who gets to charge their phone, computer or camera first. At one point, we had seven devices charging at the same time… there are THAT many outlets! Finally, the view. The Mirage was the first resort on the Strip to utilize the famous Y-shape design, which allows every single room to have a premium view. Guests are often given Volcano-view rooms which overlook the Las Vegas strip, but you can also opt-in for a pool view which is equally as stunning. Tip: While you can pay extra for a guaranteed Strip-view room, often times if you simply show up before 12 p.m. and request if free upgrades are available, you’ll be given a high-floor Strip view room at no additional cost. If you judge a resort on their pools as much as you judge their rooms, then this is the Vegas hotel for you! 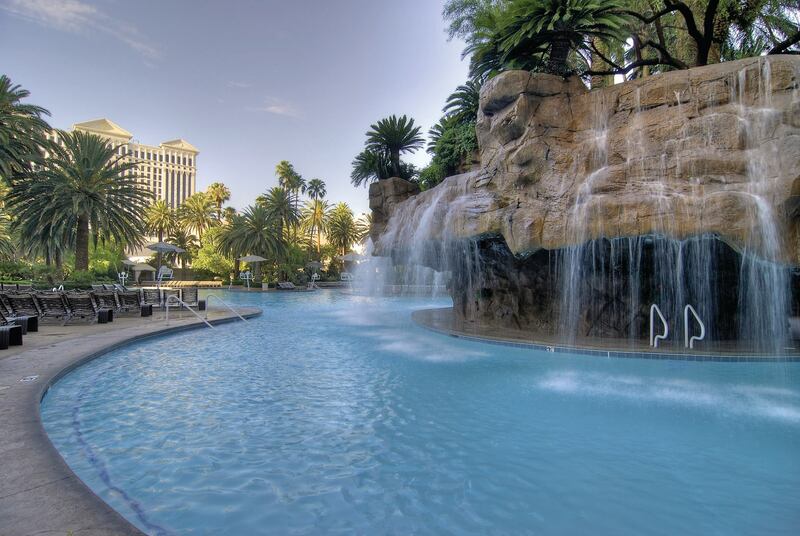 The pools at the Mirage are incredible, with large, natural form pools, waterfalls, a private oasis, and a 21+ top-optional pool called Bare. 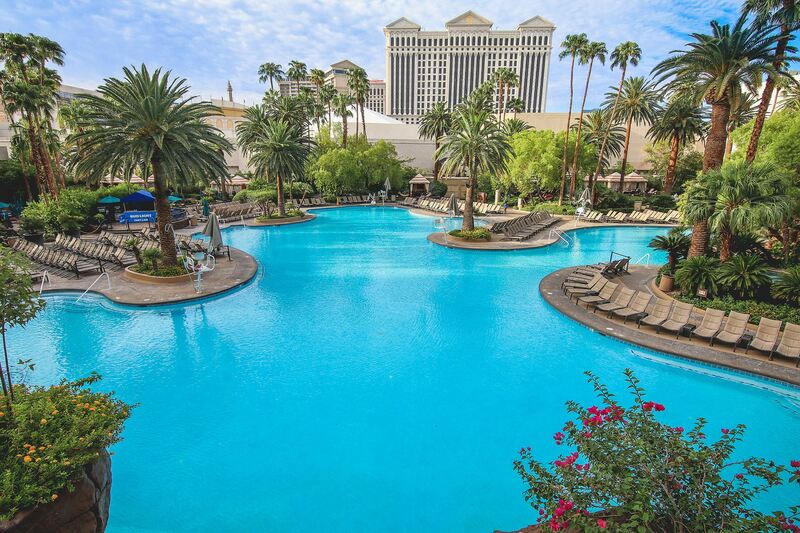 What separates the pools at Mirage from the rest of the pools on the Strip, is how affordable everything here is. While many resorts have limited loungers or they charge you to have a chair, the Mirage provides HUNDREDS of lounge chairs at no cost. They also have free ice water booths located throughout the pool areas, and their food and drink menu is extremely affordable with lunch starting at $10 per plate. It’s quite easy to spend a full day lounging by the pools, and most guests do. Not only are their pools open later than the competitors (6 p.m. fall/winter and 8 p.m. during the spring/summer) but they’re open and heated year-round. Tip: The pool area is such a draw to Mirage guests that chairs do fill up quickly. Aim to be at the pool within the first two hours of it opening for the day if you need more than two seats next to one another. One thing that’s especially awesome about the Mirage pool area is their cabanas! If you have a large group (shoutout families and bachelor/bachelorette parties), these are a great way to ensure you can spend all day at the pool and have your entire group sitting next to one another. Cabanas run on average for $350 per day which sounds like a lot, but you also get a lot. Each cabana comes with fruit plates, assorted dry snacks, assorted non-alcoholic beverages, bottled water, and of course, your own private piece of paradise! While they aren’t ideal for small groups (consider the day loungers instead located at the private oasis pool), these are perfect for large groups. You’ll frequently see bachelorette parties of 10 ladies here, which brings the cost down to just $35 per person. With the food and drinks you get, this is definitely worth it for large parties. 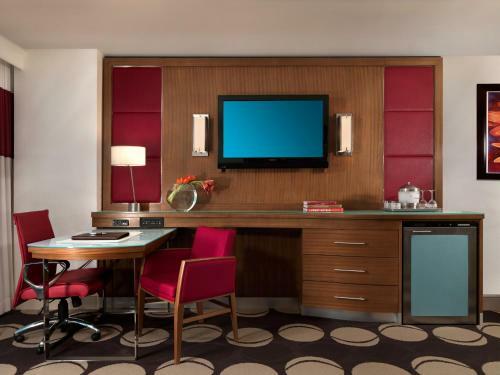 Tip: Make sure you reserve ahead, but after you book your room. Room guests will occasionally receive emails to purchase a cabana for $100 off while cabanas are available. 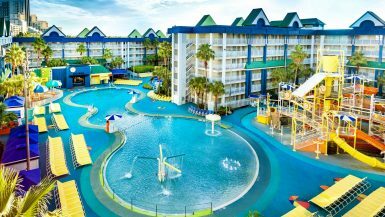 This is a huge bargain which makes the cabana worth it for large families or groups. If you want one, never wait until the day of to purchase. 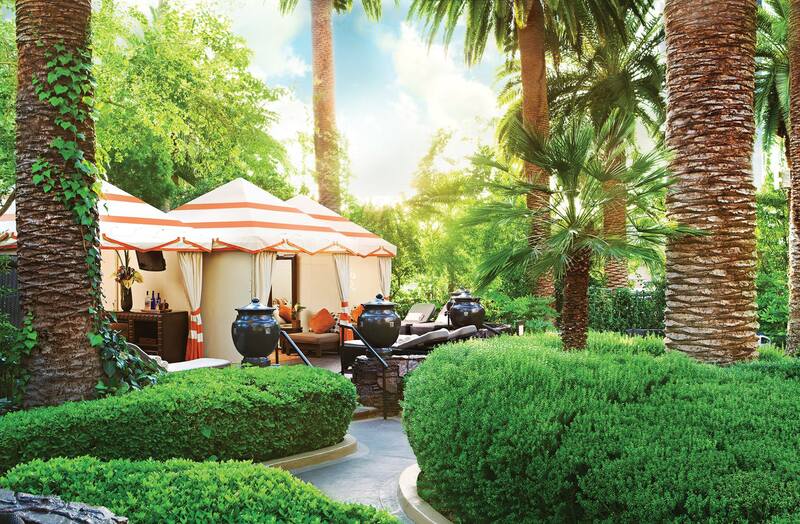 Not only do you risk not having a cabana available, but the prices often skyrocket up to $990. If you know you’re going to rent a cabana, ensure you purchase yours at least 24 hours in advance. Paradise Cafe is your go-to for all pool food and drinks. They’re located next to the waterfall, right after you get your complimentary towels. They offer the best value for affordable meals and a comfortable place to cool off after tanning. This is where all pool food and drinks come from, even if you order from your hostess in the pool. 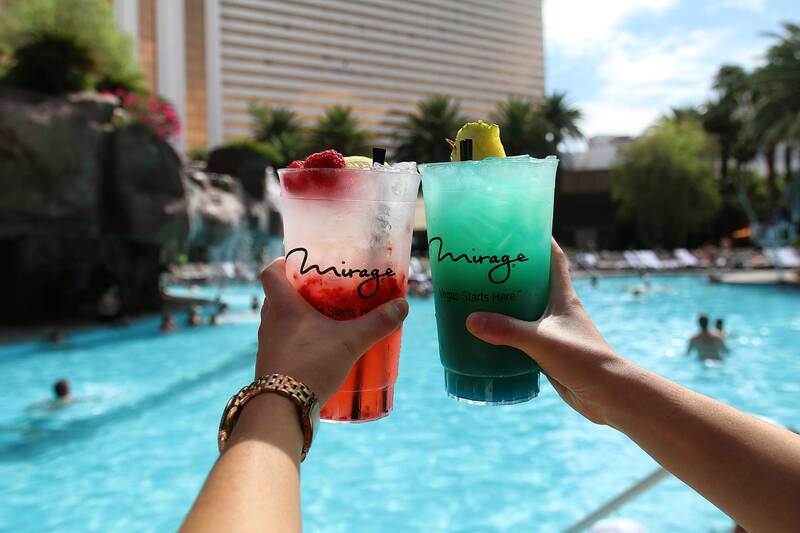 The Mirage has some of the best tropical drinks on the Strip. 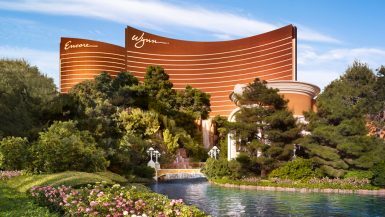 With the exception of the Coco-jito at the Paris, the Mirage is where you’ll truly feel like you’re in an all-inclusive Polynesian resort. The drinks can be pricey ($8-24), but there are often deals for buy one get one free, like on MyVegas which help to bring costs down. Also, while regular cups are cheaper than souvenir cups (not pictured), you do save money on each “refill” you purchase in your souvenir cup. So if you’re planning on drinking over an extended day, that one $24 drink may just become a bargain! Note: Mirage never uses any artificial colors or flavors and are corn syrup free! Their menu items also provide a variety of vegetarian, vegan and gluten-free choices for those who have dietary restrictions. There’s a variety of nighttime entertainment at the Mirage for guests of all ages. The volcano show erupts nightly on the hour, every hour, from 8-10 PM. You can absolutely see (and hear) the show from your room if it’s a Strip view, but for the ultimate experience, you’ll definitely want to watch from the Strip. Not only will you get the up-close experience as seen in this photo, but you can truly appreciate the size of the fire show. 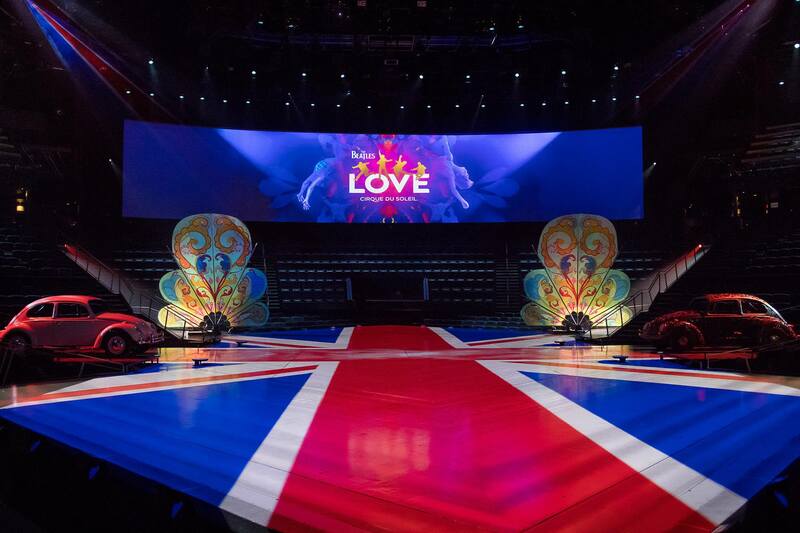 While there are a variety of entertainment options, one must-see show is the Beatles LOVE by Cirque du Soleil. Not only is it one of the top-rated shows on TripAdvisor and Yelp, but it’s one of the most unique as well. By having the stage in the middle of the audience, there isn’t a single bad seat in the arena. It’s a fun, upbeat show that’s family friendly, and incredibly entertaining. I’ve seen the show twice, and it’s one of my favorite Vegas shows, tied with the JabbaWockeeZ. Tickets start at $55 online, and you can frequently get free show tickets on MyVegas as well! Tip: Photography isn’t allowed during the show for the safety of the performers, but you’re allowed to take photos both before and after the performance and are actually highly encouraged to do so! If you’re looking for an updated Vegas resort that balances excitement with relaxation, this is it. The Mirage is consistently cheaper than a variety of comparable hotels on the strip, it’s in one of the best locations, and the view from the rooms is unbeatable. 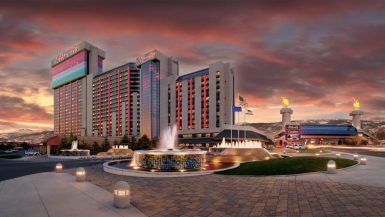 No other hotel on the Las Vegas Strip comes close to offering the same value for room size, view, and amenities. The Mirage makes visiting Vegas FUN, and after all, isn’t that what vacations are all about? For more information on The Mirage, you can visit their website HERE. Keep reading! 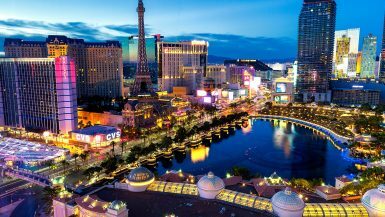 Here’s how you can score $19 flights to Las Vegas!